Come and meet Sandra Brown, here to help you at Physiotherapy Services Caerphilly. Since qualifying as a chartered physiotherapist in 1986, Sandra has worked extensively in the public and private sectors treating all forms of musculo skeletal conditions. 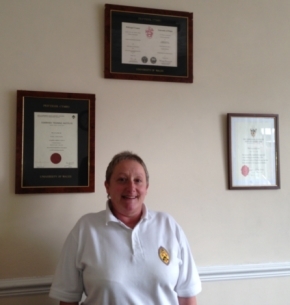 Sandra has worked with elite athletes including the Wales Mens Hockey Team, Local Rugby Squads, U18s Welsh Basketball Squad, and provided a very successful sports injury clinic at the National Sports Center for Wales. As an active and professional practitioner, and through continued professional development, Sandra is able to provide an exceptional level of physiotherapy services, utilising the latest evidence-based practice and acupuncture to treat injuries. Working very closely with some of the top orthopedic consultants in the area, Sandra has extensive experience working with all types of injuries, surgery and musculo skeletal conditions.